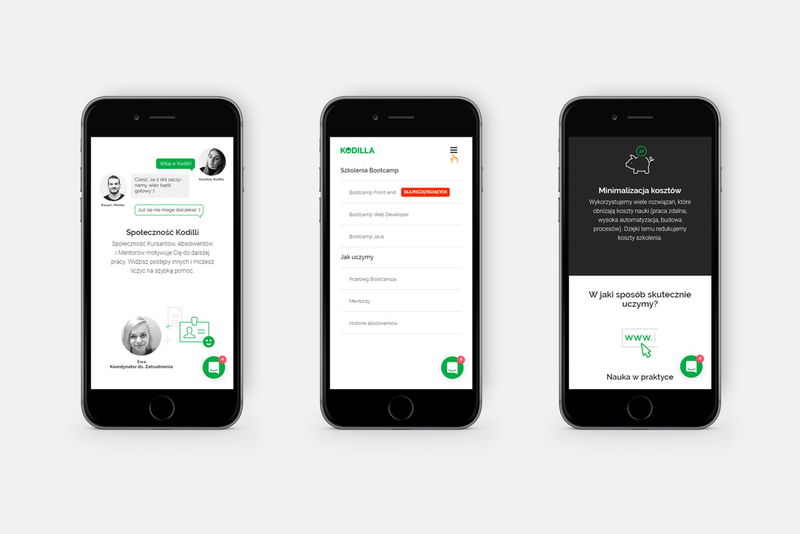 For the Kodilla school, the website is the primary communication channel with its candidates, as well as the final platform for them to decide whether to enroll in a course. The clarity of web pages and logical content presentation played the key role in the website’s design. 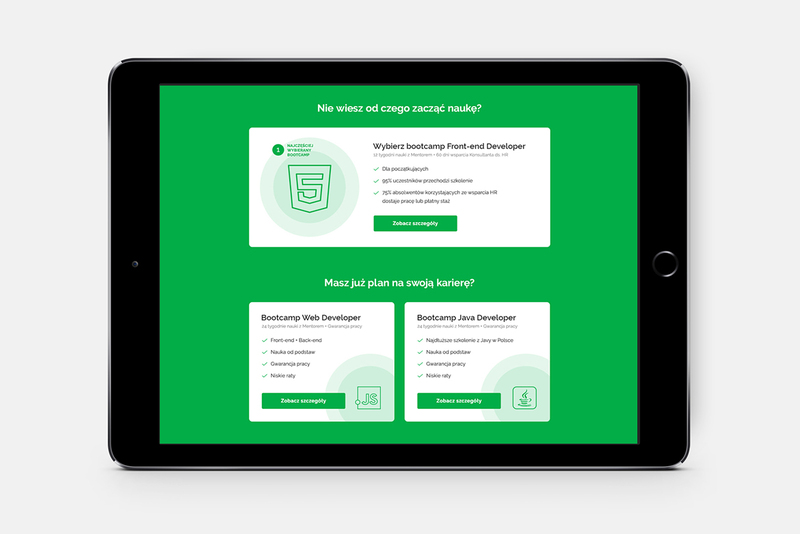 The design had to support the school’s image, while enabling seamless navigation through its offer and presenting the school’s competencies. Refreshing the school’s image and aligning its website with modern design trends. As a part of the redesign, the logotype got a face-lift. The new visual identity included an update to the font as well as remodeling the eye embedded in the crest. This way, the logotype has gained more legibility and an edgy character. The new website integrates lifestyle with the themes common for the IT sector. The key visual on the homepage is empowered by the call-to-action strapline. The page is limited to the very minimum content, additionally underlined by lots of space in the background. The minimalistic narration focuses on the main benefit of education, i.e., finding a well-paid job after the course. The school’s reputation is expressed through the carousel displaying the logos of companies that have hired graduates from the school. To support the website, the infographics referring to particular bootcamps have also been created. All web pages have been designed in line with the brand’s new visual identity. "The highest Dawid's merit was that if he had promised to deliver a project on the following Friday, the project would have been ready on this very Friday. His hard drives don't crash, his Internet access doesn't fail, his brother-in-law doesn't pop over ;). Everything's right on time. This kind of reliability and dependability is a rarity among graphic designers. Another big plus is seamless and concise communication. I highly recommend working with Dawid".